The long hours of planning and the late nights of preparation will pay off when the doors to your new bar finally swing open. But now comes the fun part — learning how to run your bar. Make a list of your favorite bars in the local neighbourhood and decide what you like about them. Then when you visit them, look for commonalities and take note of anything that stands out — both positively and negatively. Talk with the bar staff (and the owner, if you can manage it) and observe the service. Make sure to take notes. You can even extend your research to identify the differences in bars between the neighbourhood you’re planning to open in and other locations, to determine what your local audience is going to love or hate. Then list out the establishments that don’t appeal to you and find what makes each of them similar. A trip to a bar that you don’t like may not be a lot of fun, but you’ll learn a lot about what you mistakes you want to avoid in your own bar by observing it first hand. Order the Square Reader for contactless and chip. A big issue for a lot of owners is a lack of capital. Startup costs aside, running a successful bar can be a substantial investment that you need to be prepared for. This funding should cover costs that come up including inventory, marketing, and building renovations. Speak to a Financial Adviser if you need help planning for what investment is needed to keep your operation afloat in the beginning. Overcrowded bars are a customer’s worst nightmare. When you’re designing your bar’s layout, put yourself in the customers’ shoes to identify their ideal experience. How much standing room will your customers want? How many barstools can you add without cramping the space or making it difficult for people to approach the bar to order a beverage? Planning the design of your bar can be extremely beneficial to avoid negative customer experiences down the line. Before you start pouring drinks and entertaining guests, there is another relationship that needs to be fostered. Your local neighbourhood businesses — whether it’s a dry cleaner or a clothing retailer — can add immediate value to your business. Because they have both a strong understanding of the local neighbourhood, as well as a clientele that you will hope become your future customers, these business owners can provide insight on how you can be successful as well as a recommendation to new customers. Your crowds are likely to be the heaviest on the weekends, but you shouldn’t try to keep your bar in business on a Saturday night’s trade alone. Encourage customers to visit during the week to split your trade amongst several nights. Many bar owners schedule regular activities such as happy hours, trivia nights or social events to increase regular visitation. 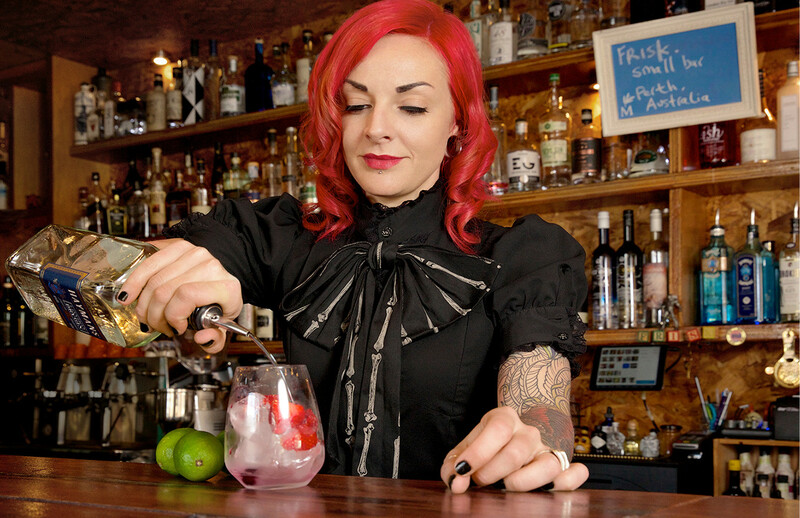 The customer experience at your bar can make or break your new business. Customers remember an inattentive or rude bartender, and the poorer your service, the less likely they are to return again. When hiring and training your employees, make sure they have a genuine manner and a customer-first attitude. Do everything you can to keep your employees happy, to ensure that they in turn will keep your guests happy. It’s not a secret: effective inventory management can be tedious, but learning how to to do it is critical. To successfully run a bar, you need to use an effective inventory management tool that empowers you with full visibility into what’s in stock and what orders need to be placed. Additionally, having powerful analytics software that will allow you to evaluate your sales, look for trends, and better forecast inventory will help you make data-based decisions that will help your bar grow. Have you ever picked up a drink menu and felt overwhelmed? Having too many options can sometimes have a negative effect on customers. It can also impact negatively on your finances — more items on the menu means more inventory to cater for the wider range of ingredients, not to mention potential for waste. Keep your menu simple when you open and test out drinks by trialling seasonal specialties or items on a regular basis. An added bonus of testing drinks is that a changing menu will keep your customers returning for more. What beverage do you want your bar to be known for? Generate buzz in the local community and intrigue new visitors by creating a signature drink exclusive to your bar. Once you’ve settled on your signature drink, make sure you promote it in your bar and through social media. Great bars can sometimes limit their potential customers by not offering an environment that can be enjoyed by many. Dietary restrictions — whether they’re because of an allergy or a lifestyle choice — are common these days. Some customers like live music, while others also want a quiet place to sit and enjoy the company of friends and family. Decide whether you want your bar to attract the widest possible audience, or a specific crowd, and then design your business environment to make it as accessible to that target customer group as possible. Also be conscious of not alienating a customer group completely. For example, a menu that offers options for gluten-free eaters, vegans, or people with dairy issues will ensure that you’re catering for this growing audience.